The University Writing Program has implemented a number of curriculum, assessment and other innovations that have led to national recognition from the Conference on College Composition and Communication. UWP was one of nine institutions to receive the conference’s Writing Program Certificate of Excellence. The award was presented on Friday, March 16 at the Conference on College Composition and Communication’s annual convention in Kansas City, Mo. CCCC is a constituent organization within the National Council of Teachers of English. “This award pays tribute to the University Writing Program faculty who have spent six years building an independent program through curricular research and design, and through the revision of student learning outcomes and assessments designed to inform how we teach writing,” said Joan A. Mullin, University Writing Program executive director and English professor. The UWP serves the entire university and is housed within the College of Liberal Arts & Sciences. The selection committee commended the UNC Charlotte UWP team for collaborating to bring about positive change, including revamping the first-year writing curriculum to better reflect best practices in the field. This included employing a social constructivist approach, which emphasizes how knowledge is constructed through interaction with others and how audience expectations can shift from context to context. The program also has paid keen attention to implementing a number of measures, both short- and long-term, to assess the effectiveness of the program. The committee remarked upon innovations in curriculum that keep First-Year Writing “lively and alive.” Committee members cited the move to a one-semester first-year writing requirement and a second sophomore-level course taught by faculty across campus. Writing program faculty, and faculty university-wide have started exchanging vocabularies and pedagogies in an effort to support what is called writing transfer. The award selection committee also acknowledged the program’s efforts to support the university’s diverse student population through dedicated sections so international/multilingual students and domestic/monolingual students focus on global issues together. The committee paid particular attention to the program’s outreach efforts through efforts such as the Veterans Writing Group, noting that this could offer an effective model for other institutions. The judges pointed out as another strength a stated commitment to equity, coupled with concrete actions that include the completion of Safe Zone diversity training for over 50 percent of the program’s faculty, and faculty and staff participation on the University Diversity Committee. “Even as this program has grown quickly, it has done so in principled ways,” the committee commented. 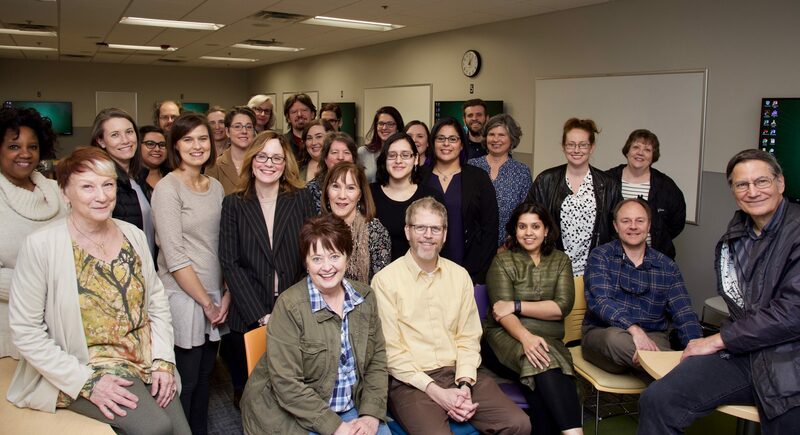 “There’s much to admire in the shared governance model, the respect for (lecturers), and the reduction of reliance on adjunct instructors.” UWP provides professional development for lecturers and in-house opportunities for adjunct lecturers, when hired. Established in 2004, this national award honors up to 20 writing programs a year. To be eligible for this award, programs must be able to demonstrate that the program imaginatively addresses the needs and opportunities of its students, instructors, institution, and locale; offers exemplary ongoing professional development for faculty of all ranks, including adjunct and contingent faculty; treats contingent faculty respectfully, humanely, and professionally; uses the best current practices in the field; shows that the program administrator has academic credentials in writing; uses effective, ongoing assessment; uses effective placement procedures; creates appropriate class sizes; and models diversity and serves diverse communities. The Conference on College Composition and Communication, with more than 4,500 members and subscribers, supports and promotes the teaching and study of composition, rhetoric, and communication skills at the college level, both in undergraduate and graduate programs. The National Council of Teachers of English, with 25,000 individual and institutional members worldwide, is dedicated to improving the teaching and learning of English and the language arts at all levels of education.